A car bomb exploded in the parking lot of Afghanistan’s Ministry of Justice on Tuesday, killing at least five people and wounding dozens as civil servants in Kabul were leaving work for the day, officials said. The Taliban claimed responsibility for the third attack targeting justice system employees this month, saying the insurgents would continue to kill “slave” judges and prosecutors. The huge explosion sent black smoke billowing above the city and was strong enough to rattle windows several kilometers away in Kabul’s diplomatic district. Police said the suicide bomber detonated a car laden with explosives. Taliban spokesman Zabihullah Mujahid said the insurgents considered Afghan courts a tool of the U.S.-backed Afghan government and accused them of conspiring in mistreatment of detainees. “Based on this, the slave administration prosecutors, judges and personal of Ministry of Justice have been our target, and our attacks will continue while their cruel activities continues,” Mujahid said in an emailed statement. The Taliban had already attacked employees of Afghanistan’s justice system twice this month. 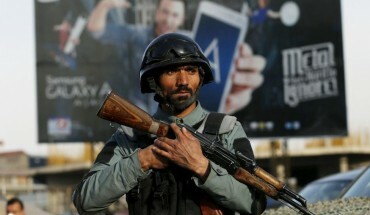 It was also the fifth major attack to hit the Afghan capital in a little over two weeks, coinciding with a new insurgent offensive across the country. On the morning of May 4, a car bomber detonated near a bus carrying employees to work at the attorney general’s office, killing at least one person. Six days later, another suicide bomber rammed a bus in the same area taking workers home. Five prosecutors were killed in that attack, according to the United Nations, which condemned targeting civilians and legal professionals as potential war crimes. READ ALSO : Find Out Why Poor Men Prefer Large Breasts, While Rich Men Prefer Small Breasts!!! At least five people died in Tuesday’s blast, Ministry of Interior spokesman Sediq Sediqqi said by telephone. A Ministry of Public Health spokesman said 42 wounded people had been admitted to three hospitals in Kabul. The Taliban have ramped up attacks across the country since they announced a new offensive last month and have been hitting Kabul hard.